anniversary of the Great War. Description/Additional Information: The meeting was called to order by Thomas McDaniel. Chuck Kiser announced the status of “Wreaths Across America” and said he would be accepting all donations throughout the evening,and would give an update at the end of the night. Chris Vonderau offered the blessing, and special guests and VIPs were invited to go to the buffet line, to be followed by Post members and their families. At precisely 7:00 p.m., the Commander introduced the program entitled “100 Year Anniversary of the Great War” by Nathan Waller. He had several sections of his program, and provided audio for the entire program. Very impressive with an authentic uniform and accessories of a World War I “Tommie”. Nathan received a standing ovation from the Post 555 members and families. 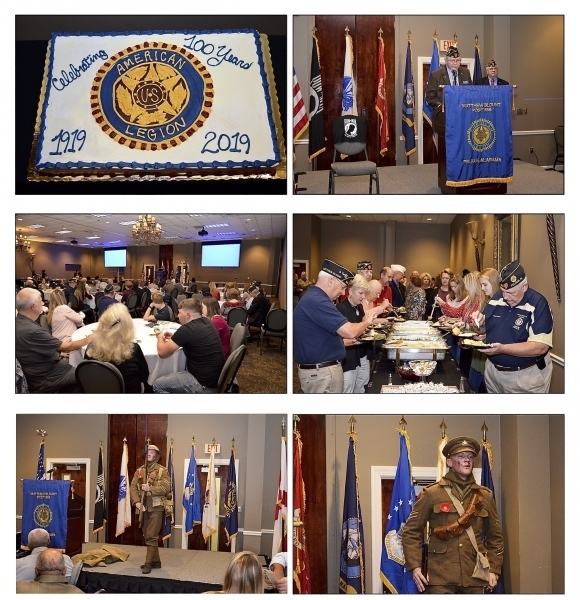 The presentation of the American Legion 100 Year Birthday cake and photos was next, with the cake being served and enjoyed by all. Nancy Waller announced several upcoming Post events. Being that there was no business to discuss, the meeting was adjourned by the Commander. Chris Vonderau offered the benediction and all attendees departed.